A visual arts programme for Felixstowe exploring connections between contemporary art, health and the sea which took place across 2017-18. In September 2017, artist and printmaker Adam Bridgland became a beach hut artist-in-residence and produced a new print work inspired by the impact of the sea on our health. The work, ‘Upon Every Wave Our Wellbeing Rides’, was screen printed live from Beach Hut no.4. The set of 10 limited prints are available to purchase. More information is available on our Editions page. Artists Adam Bridgland and Caroline Wright undertook residencies in Felixstowe to develop or reimagine work which used the brief of ‘THRIVE | REVIVE’ as a starting point. The programme produced across the Summer comprised public art interventions, consultations, performances and events. Both artists also worked alongside local youth project Level Two. 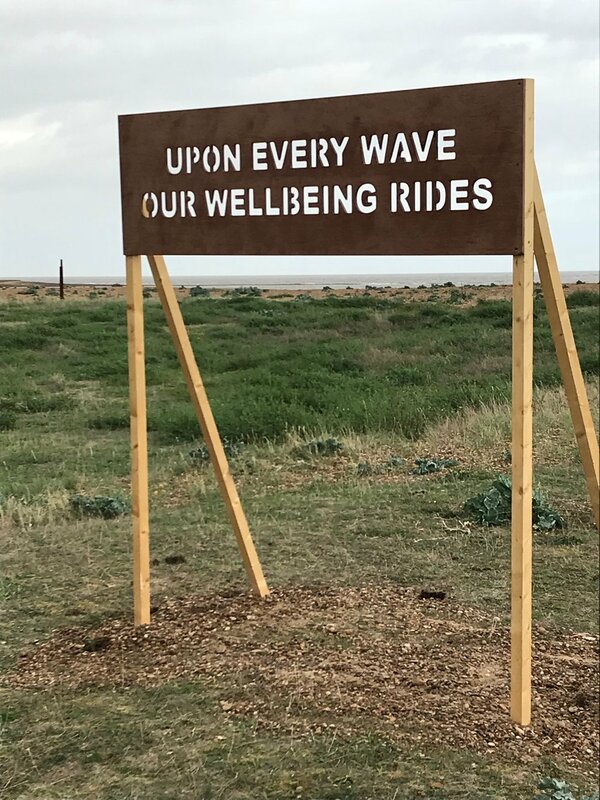 Adam Bridgland produced two public art interventions in Felixstowe, extending his screen print‘Upon Every Wave Our Wellbeing Rides’. These words were seen on a sign-like structure that seemed to grow out of the landscape. Situated in front of Old Felixstowe’s Martello Tower and with the North Sea as a backdrop, it invited us to consider the motion of the sea as a metaphor for our experience of life. It’s DIY aesthetic riffed on harbour notices alerting us to ferry times, ice-cream prices and the ‘catch of the day’: direct messages from coastal workers. The second work was located in the shop-front window of 40 Hamilton Road. Titled ‘Out to Sea’ the image referenced the sea as a place of sanctuary and solace and was a nod to the importance of the open-water swimming community within the town. Caroline Wright was in-residence in a sea-front beach hut from 12-16 September. 'Breathing Hut' explored new modes of engagement with Wright's ongoing project 'Breath Control'. During this public residency, the artist worked collaboratively with soprano Laura Wright and the local community to investigate perceptions of air quality in a common context of the sea. From conversations to shared experiences, the artists worked towards short and intimate performances for small audiences. Participants were invited to share their stories of breathing and of being by the sea and contribute to a growing installation of breath in the beach hut.